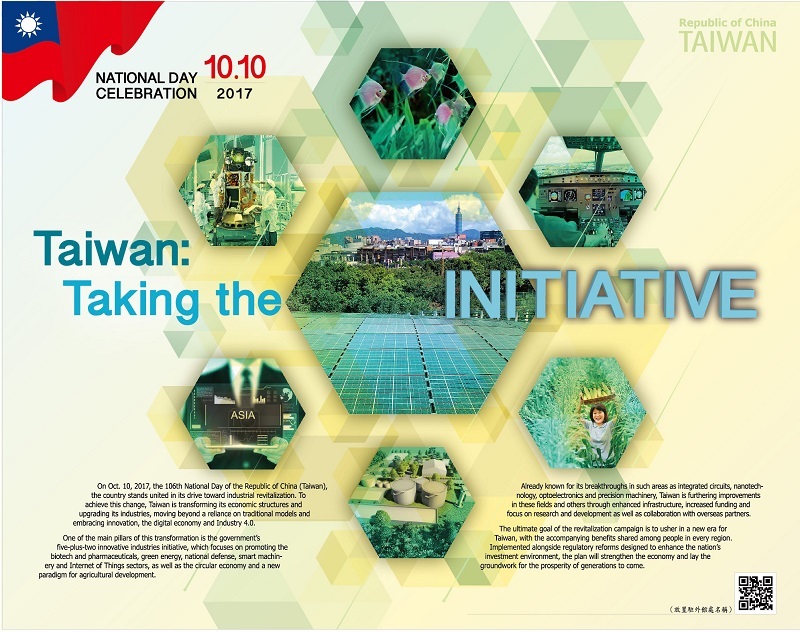 On Oct. 10, 2017, the 106th National Day of the Republic of China (Taiwan), the country stands united in its drive toward industrial revitalization. To achieve this change, Taiwan is transforming its economic structures and upgrading its industries, moving beyond a reliance on traditional models and embracing innovation, the digital economy and Industry 4.0. One of the main pillars of this transformation is the government’s five-plus-two innovative industries initiative, which focuses on promoting the biotech and pharmaceuticals, green energy, national defense, smart machinery and Internet of Things sectors, as well as the circular economy and a new paradigm for agricultural development. Already known for its breakthroughs in such areas as integrated circuits, nanotechnology, optoelectronics and precision machinery, Taiwan is furthering improvements in these fields and others through enhanced infrastructure, increased funding and focus on research and development as well as collaboration with overseas partners. The ultimate goal of the revitalization campaign is to usher in a new era for Taiwan, with the accompanying benefits shared among people in every region. Implemented alongside regulatory reforms designed to enhance the nation’s investment environment, the plan will strengthen the economy and lay the groundwork for the prosperity of generations to come.